BodyKey by NUTRILITE is a personalised weight management programme based on your lifestyle, diet, physical activity, stress level, sleep pattern, eating habits and mindset. Troubled with non-satisfactory results although you have done everything you could to shed off the excess weight? Break the barriers to a healthy life and body with our best weight management programme. 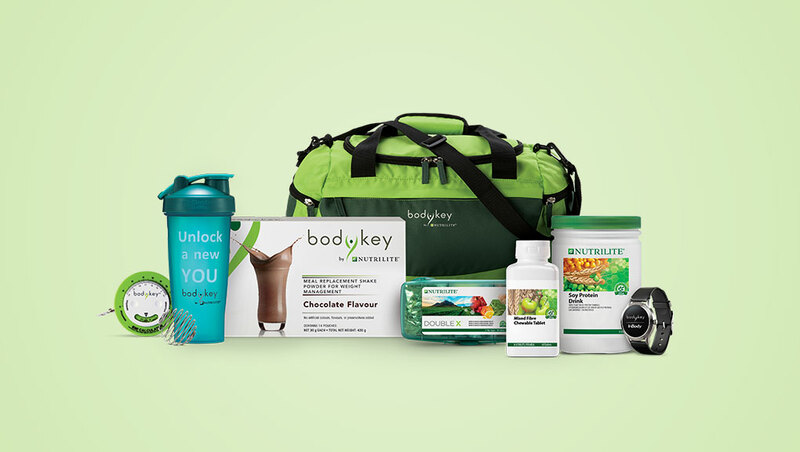 Packed with essential nutrients and fibres from nature, BodyKey Jump Start Kit supplies you with the tools and daily nutrients you need, while helping you with overall weight management. Gets you started as you embark on your personalised weight management journey. Comes with NUTRILITE products, supplements and assessment tools. Fits into your lifestyle, without taking over your life. All ingredients are derived from nature; no artificial colourants, flavours or added preservatives. BodyKey Wealth Management Programme helps you break through your weight management barriers. BodyKey programme is personalised to you, fits into your life, gives you long-term results and is easy to follow.